Its nearly the weekend- woohoo, seriously how much as this week dragged. Looking forward to a trip to Durham tomorrow with our Maxine- I’m going to be a bad influence and make her spend a fortune, then it wouldn’t be a trip to Durham without a visit for my second home- Fat Buddha. 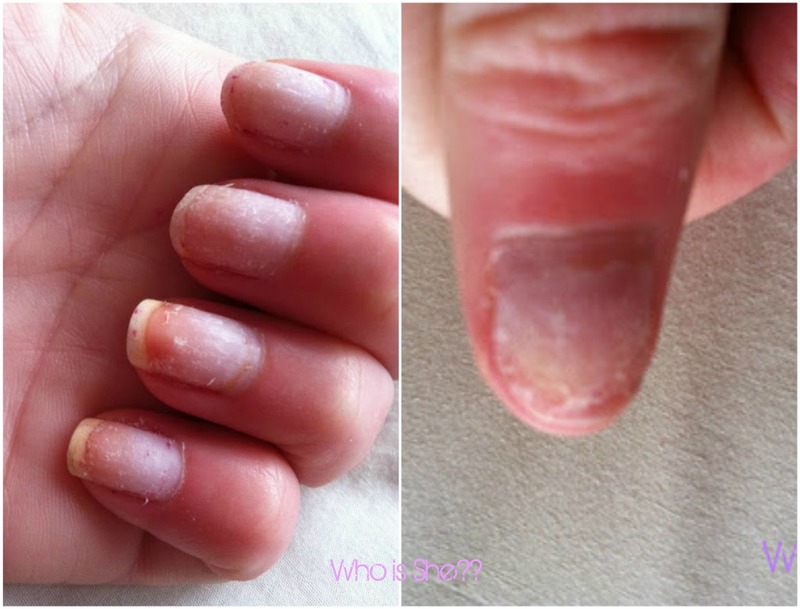 Anyway, you will have seen me mention here and here or should that be raving about Mavala Scientifique- seriously if you suffer from weak, brittle, splitting nails you need to try this product. In a nut shell, my natural nails are in so so condition- my little/ring/thumb nails on both hands are really strong, however my middle/index fingers are very brittle and have a tendency to split. My other nails at times do split however they’re still strong. Before removing my gel nails I was debating whether to buy a bottle of OPI Nail Envy to strengthen my nails however I really couldn’t wait a week for shipping from the US (ebay seller beautyzone2007) and I wasn’t paying £19 for a bottle in Boots. After a quick google search, many people had recommended this, and for less than a fiver in Boots I thought this would be better value. After removing (soaking) the gels off, this is how my nails were- there is no buffing or filing of the nails in this picture. I filed my nails right down and lightly buffed them, and let the air get to them for a good couple of hours before applying the Scientifique. The product itself isn’t a nail polish, it’s a liquid which is absorbed into your nails before applying polish. And its STINKS. Also you can’t get this on your cuticles or your fingers will drop off (slightly exaggerated there). Mavala state that for the first month of using this you should use it once or twice a week for a month and then after that use it only once a month. I would use it on a Wednesday and Sunday and then apply OPI Passion once absorbed. Left hand- nail growth in 3 weeks. Right hand- note the difference in my thumb since 4th Jan.
Its quite a transformation isn’t it. My nails are so much stronger and healthier since using this, and I was rather surprised by how much my nails had grown in less than 3 weeks. My index and middle fingers were much stronger, and in the three weeks there was no splitting of any nails- which for me is very rare. I initally thought that the white patches on my nails were damage, however the nail technician had informed me that it was actually bits of gel which I hadn't soaked off. For such a small price, I would definitely recommend this. I think the pictures speak for themselves. If you are from the Durham area Boots at Durham City Retail Park (near Tesco), Boots and Fenwicks at Newcastle, and Boots at the Metro Centre stock Mavala.